1. Pull apart (Shred) the cooked corned beef using a fork. 2. Dice up the pre cooked potatoes . 3. Soften the chopped onions in a pan with a table spoon of oil. 4. Add two dessert spoons of homemade chicken stock and 1 teaspoon of wholegrain mustard to the softened onions, stir and simmer for 1 minute to heat stock. 5. Add your diced potatoes, shredded corned beef and onion/stock/mustard mixture together in a large mixing bowl. 6. Form small potato cakes with your hash mix and place on a hot pan, browning both sides of the cakes. 7. While your cakes are browning, cook your poached egg. We cheated using a stainless steel egg poacher. 8. 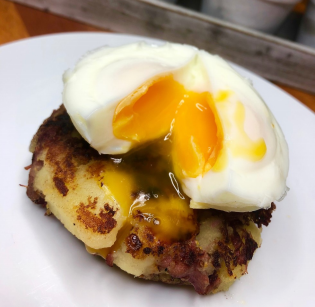 Serve soft/medium poached egg on top of your hash cakes and ENJOY! !